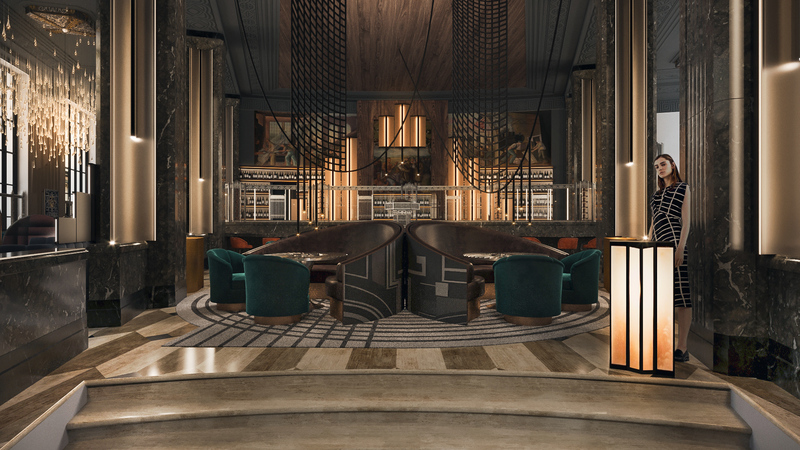 Mini boutique hotel NY Exchange will be located in the 20 Exchange Place, a 57-story Art Deco building in the Financial District of Lower Manhattan. Formerly known as the City Bank-Farmers Trust Building, it was built between 1930–1931. It was ultimately sold in 1979. The building remained untouched since that time, what gives us the privilege to work with the historic building in the original Art Deco style. 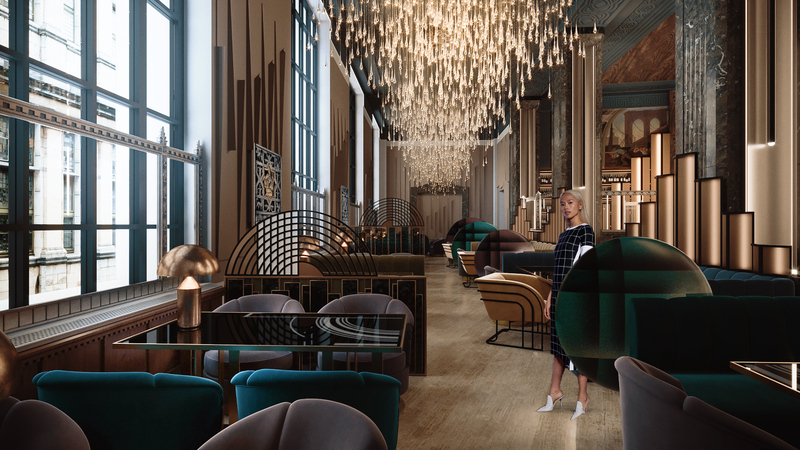 To transform 8 floors of 20 Exchange Place into a 5* multi-functional space that consists of the mini boutique hotel of 13 rooms, the SPA, the cabaret and the gastronomic complex. We had to take into account the historic architecture of the building and the facilities and spaces designed specifically for the bank needs. For instance, we got a legacy of safe-boxes, even a two-compartment one, which we integrated into the new interior. Besides, the hotel will be neighboring with apartments. Thus, it was important to respect the neighborhood and to make the new place co-livable with locals. The design concept takes aesthetic clues from Art Deco heritage of the venue fused with the contemporary materials and forms. We took the authentic Art Deco patterns and elements and scaled them up into modern forms of furniture and decorations. 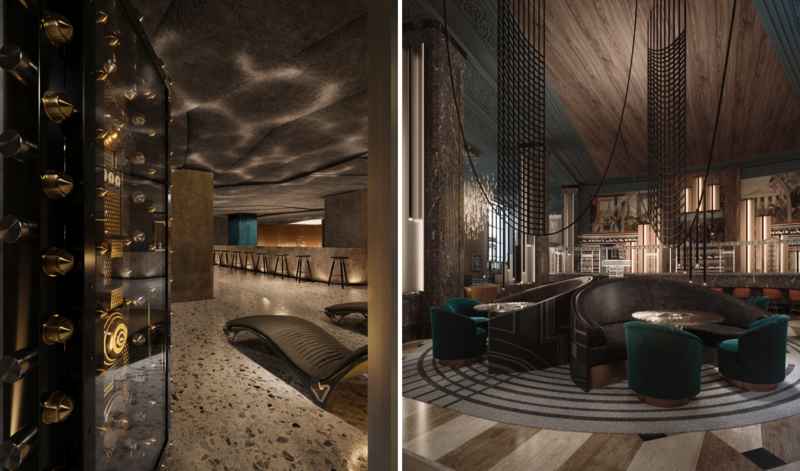 Initially, the client didn’t plan to include hotel into the project. However, he thought that noise from the restaurant and cabaret would be disturbing neighbors of the apartments in the building. Thus, he decided to rethink the concept, to make it more comfortable for locals as well, and to organize a mini hotel for the guests of the place. The project provides the entire bouquet of experiences for sophisticated audience of the district and NYC. Multi-functional space with a mini hotel is very relevant for the changing district. Historically the business district, Wall Street is now becoming a popular residential area as well, but there is a lack of restaurant and entertainment offer. 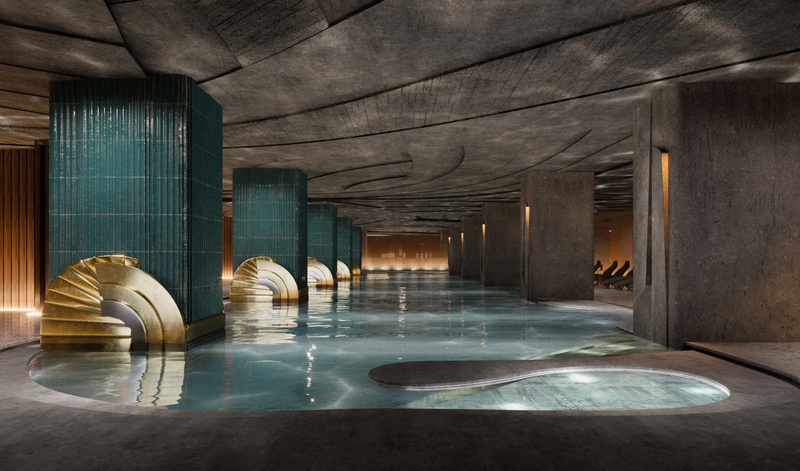 NY Exchange will definitely enrich the district leisure scene. 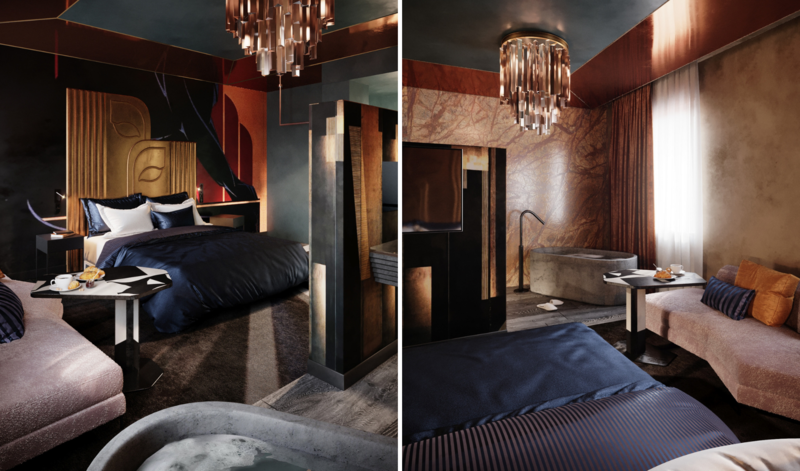 Rooms’ layout follows open layout of public spaces – restaurant and Spa centre as we intended to bring the history of the building into the rooms interiors as well. We made use of old safes, which remained from the bank facilities, spaces by locating swimming pool, lounge and wine cabinet inside them. The swimming pool is located in a huge two-level safe space. Before the start of the concept development, we hired a specialist who analyzed the facilities of the building to find out whether we could make a niche for the swimming pool in the lift slabs of the safe. Luckily, that was a solid safe, what reduced the costs of the swimming pool development. We kept an emblematic picture showing the friendship with American Indians – it serves as a decoration for the bar. 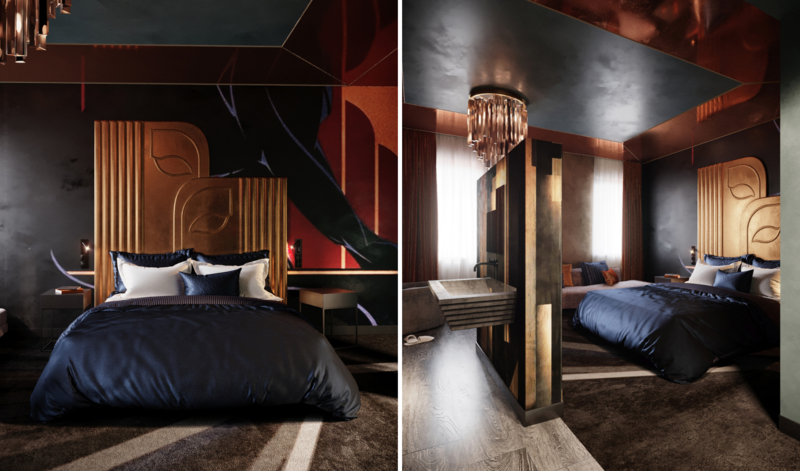 When designing furniture and decoration elements, we were finding inspiration in the authentic Art Deco works – stylized shells from earrings in a decoration of the swimming pool, broach and dinnerware patterns in the restaurant´s decoration, and the motives of a sculpture in a headboard design. However, there was no Art Deco decorations in the basement. We added Art Deco elements there for the reason to pay tribute to the history of the venue. Spaces of the venue meet different interests of guests. Spa and wellness centre works as a healthy food café, and in the evening the spaces transforms into a cabaret. 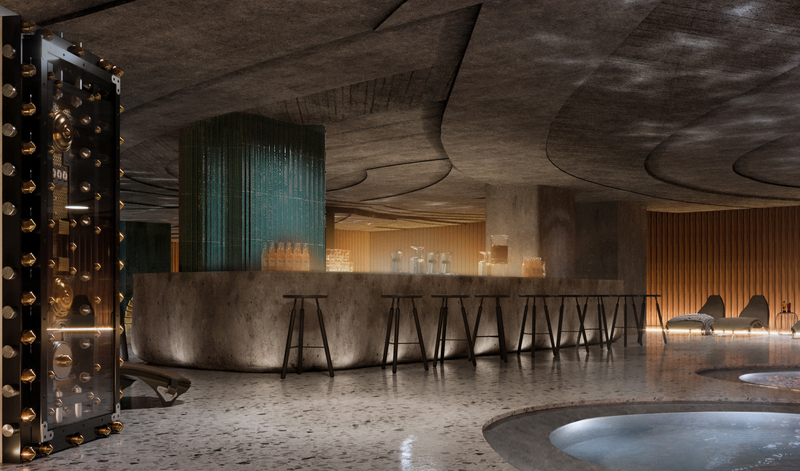 The most mysterious part is the passage to speak-easy bar / cabaret through hammam area. If you work in Art Deco style you just can not afford to use cheap material. Thus, the materials we offer add to the luxurious look of the space. The ceilings in the basement were covered by fossil linen, very dangerous material. We ordered an expensive service to remove it from the surfaces to make the building more eco-friendly. Additionally, we are going to use modern sound insulation technologies to reduce noise. We made the most of the building heritage and tried to make it comfortable both for guests of the hotel and locals. There is a distinct entrance to the restaurant for the neighbors of the 20 Exchange Place. Besides, the can enjoy a special offer for the Spa and wellness centre experience. Thus, we create a co-living space for guests of the city and New York citizens.